Once you're done here, head over to the prefrosh portal. How to ride the subway like an expert, or, since you're now a Columbia student, how to look like an expert while riding the subway. MetroCards can be purchased in the station from MetroCard vending machines using cash, credit, or debit. A single ride MetroCard, good for two hours, costs $2.50, though customers can save by purchasing pay-per-ride MetroCards. Pay-per-ride MetroCards can store between $4.50 and $80. Putting on $8 or more on your pay-per-ride MetroCard triggers a 5% bonus. Unlimited MetroCards are also available for one day until the next 3 a.m. ($8.25), for seven days ($27), or for thirty days ($89). Complete MetroCard information is available here. Trains are often rerouted for system maintenance, especially on late nights (commonly between midnight and 5 a.m.), weekends, and holidays. It may be a good idea to check the MTA website for service changes and alerts before leaving. Advisories known in advance specific to individual stations are generally posted throughout fare control and subway platforms. A weekend summary is commonly posted next to the system map on subway platforms. Station attendants, usually located in booths at many points of fare control, should be able to assist with routine questions. Take the (1) train to 116. If beginning south of 96 on the Broadway IRT (1), (2), and (3), make sure you are on a (1) train before leaving 96. When service is running normally, this means walking across the platform at 96 to the local track. When (2) and (3) trains are running local (late nights and sometimes due to system maintenance), this means detraining at 96 and waiting for a (1) train on the same track. (2) and (3) trains do not run up Broadway north of 96. There's a world of New York north of Columbia that's mostly accessible by subway. Boarding an uptown (1) train at 116 means only an 8-10 minute ride to the Columbia Medical Center, exiting at the venerable 168th St station, and a 15 minute ride to the Baker Field athletic complex, exiting (above ground) at 215th St.
Beginning on a downtown (1) train at 116, be aware that the option usually exists to transfer to an express train across the platform at 96. The (2) and (3) express trains travel down Broadway on the Upper West Side and 7th Avenue below, making stops (alongside the (1) train) at 72, 42, 34, 14, and Chambers. Intermediate stops are accessible on the (1) train. Remember, express trains only save 5 to 10 minutes, tops, depending on one's destination. An express train that leave 96th at the same time as a local train reaches 72nd Street 2 minutes faster than a local and reaches Times Square-42nd St 5 minutes faster than a local. While time should be saved when traveling south of 34, you don't lose a large amount of time if you remain on the (1) train when traveling only as far as 42 (Times Square, a major transfer hub) or 34 (Penn Station, the next stop). If you are in a rush, as you pull into 96th, take a look at the screens displaying the wait times for the next express train and use the guidelines above to determine if switching is beneficial. Don't take the G train. Ever. There are a number of ways to get crosstown from 116. The most direct route is not by subway, but rather by bus. The M4 (heading downtown), which can be picked up at 116 and Broadway makes a left on 110 and a right down 5th Avenue (with a stop at 86 for the Metropolitan Museum of Art). The M4 runs back up along Madison Avenue. Be advised that local buses do generally stop, if requested, at every avenue and every couple of blocks. Once on the east side, the subway runs up and down Lexington Avenue. Crosstown buses are also available at 125 (one of which, the M60, can be boarded at 116 and Broadway), 96, 86, 79, 72, 66, 57, 50, 42, 34, 23, and 14, all north of Houston. 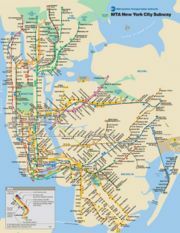 Also, the (L) subway runs across 14 (and into Brooklyn), while the (S) subway runs across 42, between Times Square and Grand Central. If you're short on time, a good technique is the pre-walk. This involves moving along the platform before your train arrives and serves two main purposes. On a busy day, pre-walking to the front or back of the train can mean a more comfortable ride in a less crowded car. Pre-walking can also minimize time spent in a transfer or exiting the station if you know the layout of your destination. For example, if you are coming uptown to Columbia on the (1), try pre-walking so that you enter the third car on the train. When you exit, you'll be right at the stairs! This technique takes advantage of the fact that you can tranfer to a bus within one hour of riding the subway. If you are making a short trip, it can save you $2.50. Suppose you're hosting a party, but you need a cable to connect your iPod to your suite's speakers. Take the subway down to 86th street, pop into PC Richards for the cable, then ride the M104 back up to campus. This page was last modified on 30 January 2014, at 00:04.